A big thank you goes out to Tray Houston for hosting the 2019 March (April) Madness Tour and Lunch! We went out through Leicester and across the back roads of Madison County into Marshall. Drove along the French Broad river back to Biltmore. What a great drive! The potty break and re-fuel stop was perfect timing. The weather was great! Ended at Beef ‘O’ Brady’s in Fletcher for a great lunch and social time. Thanks Tray! Thanks to Alvan and June Judson for hosting the wonderful 2019 Apple Blossom (prickley) Tour and lunch at La Strada restaurant in Lake Lure! The food and service was great! The route contest was the most fun I ever had at 20 mph! Congrats to Scott and Linda Jones as the winner of the contest. Those two are incredibly observant! Won an award! Hard work pays off. Pixar Pictures award presented for car “most likely to appear in a movie” 4 awards among 400 cars. Best true American( 32 Ford Roadster) Best “Outlaw”( Mercedes 1955 190 SL) with modern drive train. Best Euro (1984 635 BMW 6-series) and mine. Then towed it home! Heading to Amelia. Who`s in? Taking the car in the attached photo(My 1960 LaDawri Sebring) to the Saturday Cars and Coffee. Great looking car. Have fun at the show! A big THANK YOU! 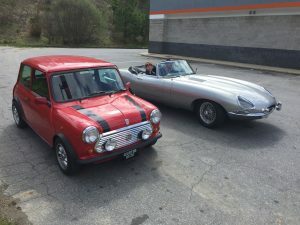 goes out to John Condren for setting up today’s joint event with the Foothills British Car Club to tour Blue Ridge Sports Car Inc. http://www.blueridge-sportscars.com/ What a great experience to see such a magnificent shop and collection of special cars. Thanks also to John Rachow for leading the drive. Also, don’t be surprised if there is a short drive (about 1 hour) at 11 that will end up back at Beef O Brady’s for lunch! Thanks to John and Jeanne Condren for hosting the Burntshirt Winery Tasting & Tour 2018 today. It was well planned. It got me over worrying about getting my car wet. I’m looking foreword our next rainy drive! Many thanks for Gene and Carole Carter’s on going work to improve the website : for sure it really is a tour de force. Thanks to Kevin and Pat for hosting the “Yaller Cathouse” Run and Lunch 2018. It was a great opportunity to see the back roads of the Brevard area. A beautiful home (and garage). Great food! The Troyer Drive and Lunch for 2018 was once again an outstanding bccwnc event. The day was cloudy with a few sprinkles but the drive was beautiful. Great lunch at Troyer’s under their pavilion. Then on to the Ramsey’s house for some wonderful desserts. A huge thank you to Terry and Mary Alice. Great June montly meeting! Enjoyed meeting the new members and catching up on club happenings! Great show afterwards in the “car park”. Thanks to John Condren for planning and hosting the Synchro-De-Mayo Uno drive! A great drive in conjunction with the members from the FBCC (Foothills British Car Club). A great group and great day indeed! Departure point and time, stops, and meals were well planned. Total mileage was 133 for Mary Alice and I. Looking foreword to the 10th Annual Great Scot! British Car Show at Furman University on May 26th! A big THANK YOU is in order for Alvan’s hosting of this wonderful drive! The route was great with views of the “apple blossoms” as the drive was so appropriately named. Great Apple Blossom tour! Great stop at the Western Town! Nice and interesting roads, too!